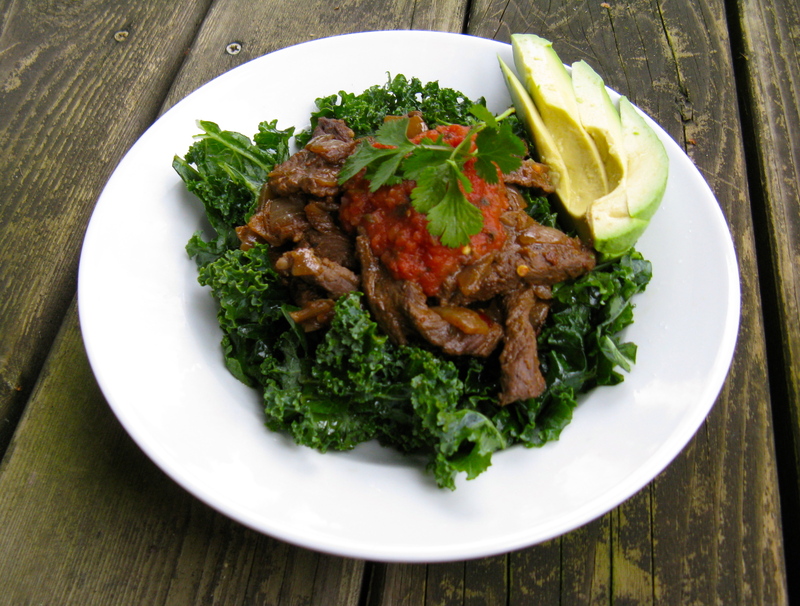 This taco kale salad with skirt steak is fantastic and has two of my favorites: kale and skirt steak. The kale even gets some extra attention with a little rubdown. Yes, rubdown, massage, salt scrub, whatever you want to call it, but the kale gets some love. Doing so softens the kale, seasons it and draws out more flavor. This technique works great with cabbage too, which is a nice alternative if you don’t have kale on hand for this recipe. Additionally, you can use ground meat or chicken instead of skirt steak, but I highly recommend the steak if you have access to it. Skirt steak is one of my favorite cuts, as it’s tender, easy and quick to cook, and extremely flavorful. In a large skillet over medium-high heat, melt the ghee. Next add the skirt steak, and season with sea salt and pepper. Reduce heat to medium, and add the taco seasoning. Saute for a couple minutes, and then add the lime or lemon juice and chicken broth. Continue to cook for a minute or two over medium-low heat. You’ll know it’s done when the meat is browned and the liquid has thickened up a bit. Meanwhile, add the torn kale pieces to a large bowl. Shake sea salt all over the kale and then massage (yes, massage) the salt into the kale with your fingers for 1-2 minutes. This will help soften the kale and bring out more flavor. 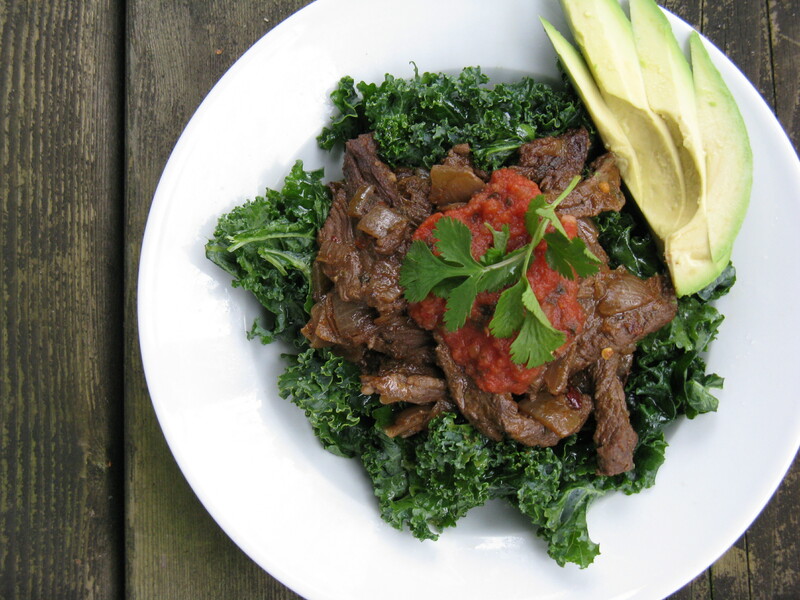 Dish up the massaged kale into each person’s bowl and top with some of the taco seasoned skirt steak. Drizzle with avocado oil and top with fresh salsa. Garnish with avocado slices and cilantro, if using. I love massaged kale! This is usually my go to quick dinner! So fresh.